, we’re making our add-on for Google Sheets to connect with Salesforce generally available. You can use it to import data and reports from Salesforce into Sheets and to push updates you make in Sheets back to Salesforce. This seamless integration will help optimize workflows and reduce duplicate work between the two products. See our beta launch announcement for more details on the add-on and how you might use it. We hope it will help you operate more efficiently. End users can install “Data connector for Salesforce” from the G Suite Marketplace. G Suite admins can deploy the add-on to their entire domain. As a G Suite admin you can control access to this add-on the same way you can any other Sheets add-on. If you have add-ons disabled for your domain but want to allow your users to use this specific add-on, you can whitelist this add-on. If you want to control add-ons across your domain, see disable or enable add-ons overall in Docs editors. 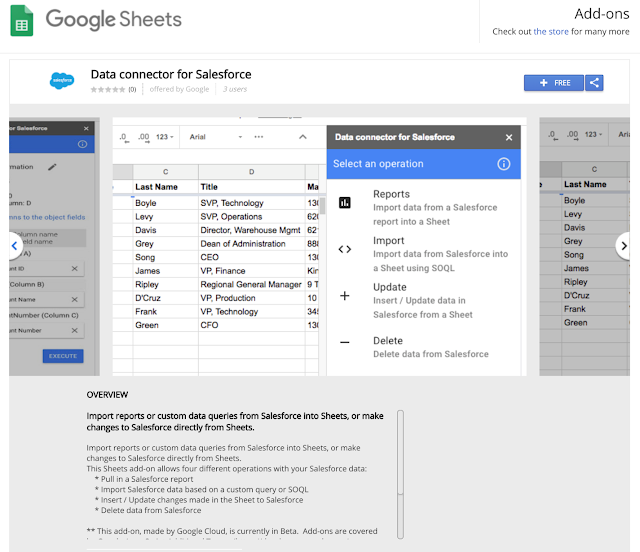 See our Help Center for more details on how to import, edit and sync Salesforce data with Google Sheets. As we recently announced, we’re making our add-on for Google Sheets to connect with Salesforce generally available. You can use it to import data and reports from Salesforce into Sheets and to push updates you make in Sheets back to Salesforce. This seamless integration will help optimize workflows and reduce duplicate work between the two products.